Picked up in 2014 by Future Classic, debut singles "Dawn" and "Heirloom" flew up the iTunes Electronic charts. 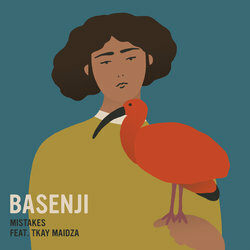 Following these releases, Basenji was named the FBi Click Producer of the Year in 2014, playing his first Boiler Room show and performing at the iconic Sydney Opera House as part of Vivid LIVE Festival. 2015's debut EP Trackpad soared online and has since accumulated over 14 million plays on Spotify, with EP cuts "Petals" feat. Scenic and "Can’t Get Enough" both topping the Hype Machine charts. In between releasing new music, the producer has kept a busy live schedule, touring nationally several times, including his recent Homework tour; a run of free shows at universities across Australia. He also made appearances at some of the country’s biggest festivals including Splendour In The Grass, Listen Out, OutsideIn, Beyond The Valley and Curveball, played a run of shows in Europe and supported Flume on a handful of dates across America in 2016. An instantly absorbing beat, Basenji’s punchy production floats between tender piano keys, a marching bass line and casting horns. The Sydney-based producer creates an orchestral sound, laying the foundations for Maidza to build the song up, then drop magic in a blissful release.